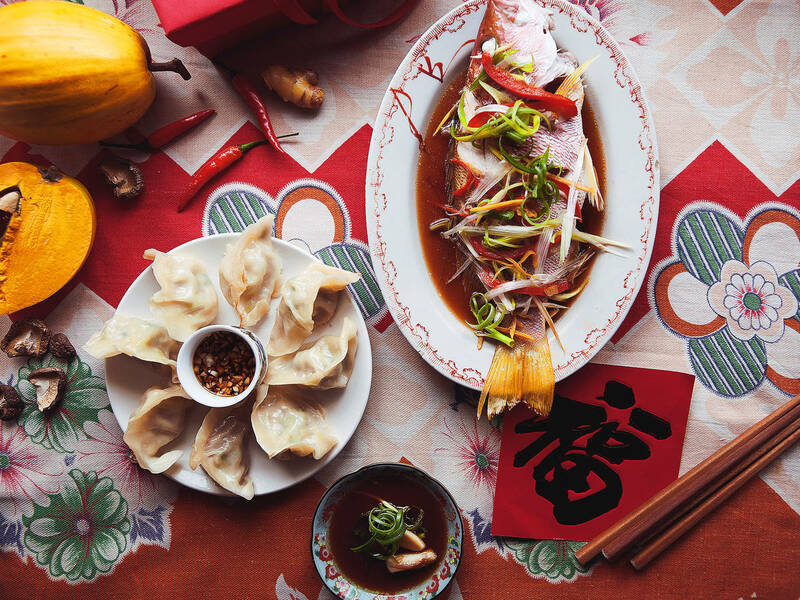 Like other important festive dates, Chinese New Year’s Eve is all about coming together with your loved ones. In China, it’s an undertaking of an epic scale, but it doesn’t necessarily have to be a stressful affair. In my opinion, the best way to celebrate is to lessen the fuss and focus more on the meaning of coming together. No laboring over numeros main dishes and synchroizing them to be piping hot for the sit-down. No. Take the pressure off yourself and put your loved ones to work (but don’t tell them that). Invite them over early. “It’s going to be an afternoon thing," tell them; an afternoon of fun dumpling making filled with jokes and loving songs. It’s a non-traditional way of preparing for the CNYE dinner—and in my opinion, it’s better for it. Therefore, I’ve put together a fuss-free menu, taking you step-by-step on what to prepare before your loved ones arrive and guiding you through a time-well-spent Chinese New Year’s Eve. Make a list. Divide the ingredients into shopping locations. This way you won’t get confused about what’s been bought and where to go next. It’s also wise to do your shopping the day before, only picking up the fish in the morning. You can pre-make the cold dishes and keep them in the fridge hours ahead. If you do this, the Daikon Salad and Cucumber Salad will need a little draining before serving. Pre-cut the trimmings for the fish: the garlic, ginger, bell pepper and green onions. Keep these fresh in the fridge. Tip: Before you refrigerate the fish, make sure you give it a good second clean, getting rid of any remaining blood clots or guts left behind will give the fish a cleaner taste at the end. Additionally, make two diagonal slits on either side of the fish to help with even steaming. It’s important to choose a clear-eyed, shiny scaled fish for this dish, for freshness is the key. A snapper or other whole white fish can also work. Buyers beware! It needs to be a WHOLE FISH for CNYE purposes. Otherwise, your luck for the year might dwindle in effect. Prep the recipe all the way to step 7. Cover well and refrigerate. Take the dough out an hour before you use it to bring it back to room temperature. Pre-cut your fruit platter. Pomelo, lychee and kumquat take special meaning in Chinese culture, but whatever fruit that will clean the palate and soothe the stomach will work. Set your dining table into a dumpling making Worker Bee Station. Have some clean cloth or plastic film handy to cover the dumplings as you go to avoid stale dough. When the fillings are coming to an end, you can fire-up the stove for the steamed fish. It wouldn’t hurt to also pre-heat another pot for boiling the dumplings at this point. By the time the table is cleared and reset, the fish will be ready to serve. There are two easy ways to consume your dumplings. Boiled and pan-fried (pot sticker style). Start with the boiled dumplings to ease your guest's cravings. For boiled dumplings, you can easily turn the cooking water into a soup that's starchy and full of flavor from the broken dumplings. Once all the dumplings are fished out from the first batch of boiled dumplings, ladle the broth into each bowl and mix well. The broth is meant to wash down the saltiness of the dipping sauce and the oiliness from the pot stickers. Chinese cuisine is all about the overall balance of the meal—dishes are always considered in relation to other dishes on the table. However you choose to divide between the 2 styles, the pan-fried dumplings require a bit more attention. Add about 1 table spoon of oil to line your pan and place the dumplings right side up leaving small gaps between them. They will eventually expand and stick together. Semi-crowd your pan without touching the sides of the pan. Pour in cold water till it marks below a dumpling’s waist or about 2cm. Cover and bring to boil for 7 minutes, or until the dumpling skin looks cooked through. Without ever flipping them, turn down to medium heat uncovered and let the water boil down. Once the bottom is crisp and brown, remove and serve on a plate crispy side up. Any left-over uncooked dumplings can be packed and frozen. Any cooked ones can be reheated up the next day by pan-frying with just oil. Following a structure to host a Chinese New Year’s Eve dinner will give you a head start. Plus, no one has ever complained about having surplus frozen dumplings in their freezer! Sleep In and Prepare Brunch: Yes, You Can!